Of course, I’ve been in many locker rooms in my life. Some with separate showers, some “gang” style. In middle school, I went through the typical 12 year old “mooning” stage, a male, pre-teen rite of passage where you bare your bottom in an effort to garner outrage from girls of a similar age. I have no qualms going to the bathroom outside on a camping trip – seems like a natural, comfortable thing to do. But this past weekend, I was shocked at the troublesome feelings conjured up while in a Smithfield’s Bar-B-Q restaurant off I-85 in Henderson, NC. We were on our way to Lake Gaston with friends for the Memorial Day weekend. Although I like North Carolina Bar-B-Q, I always feel a bit grease laden after visiting Smithfield’s. Perhaps it is the fast food nature of their establishment or the fact that the nearest thing to a vegetable I see on the menu is a French fry. After ordering, another adult on the trip decided to wash her hands prior to partaking in the meal. Considering all I had touched since my last scrub, I followed her lead. Instead of walking all the way to the bathroom, my friend stopped at a wall right beside the ordering counter. 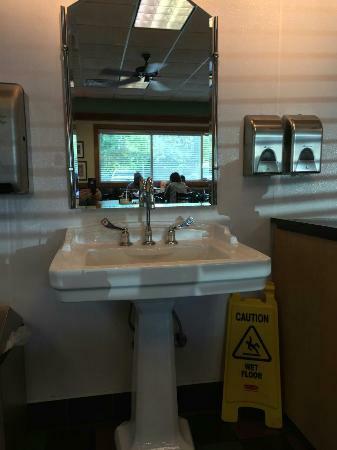 As she rolled up her sleeves, I noticed there was a sink, like the one in your bathroom, attached to the wall… in the middle of the dining area. Catherine pumped the soap dispenser and commented that it was weird to scrub with others around. When she finished, I stepped up. As I turned on the water, I immediately had the sense that I was doing something extremely inappropriate. I reasoned with myself, Danny, you’re just washing your hands, there is absolutely nothing wrong with what you’re doing. And yet, I felt as if I was exposed. Naked. Visually sharing a private piece of me that no one else should see. The water ran over my palms. I glanced around. I swear a burly dude with a huge eagle tattoo on his forearm was eyeballing me. I’d been looked at that way before – by a big cleavaged woman in Vegas. She was looking for dollars. I’m not sure what he wanted. There are just certain things you shouldn’t do in front of others and not only the obvious. You should not iron in front of those unrelated to you. It is personal. You should not pluck your eyebrows in public. Cutting toenails is private, although I did that once in an airport on an unexpected flip flop day. And apparently, washing hands is a no-no outside the comforts of a small enclosed restroom. If I were Catholic, I would confess. I just feel like I did something wrong.